Ciao, perfection! 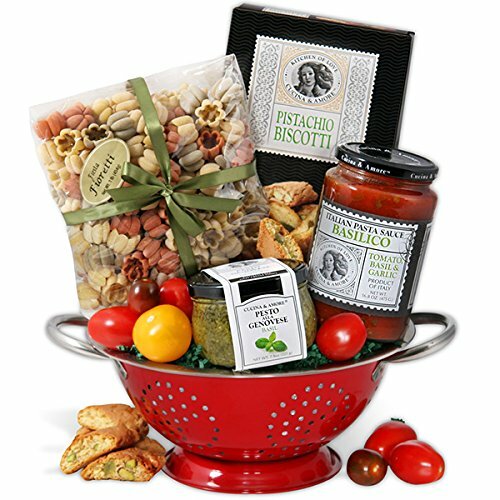 This beautiful Italian gift basket is comprised solely of authentic, award-winning foods like artisan pasta imported from Tuscany and delicious pistachio biscotti. Artfully arranged inside of an elegant stainless steel colander, these delicious foods make a flawless gift that's as pleasing to the eye as it will be to their palate. Exclusively from GourmetGiftBaskets.com. Ciao, perfection! This beautiful Italian gift basket of authentic foods is artfully arranged inside of an elegant stainless steel colander, making a flawless gift that's as pleasing to the eye as it will be to their palate. Exclusively from GourmetGiftBaskets.com. Gourmet Italian foods include basilico tomato pasta sauce, handmade artisan pasta, basil pesto alla Genovese, and pistachio biscotti! Keepsake stainless steel colander with Italian foods is professionally shrink wrapped with festive ribbon.